It’s time for take two in our weekly Time-Saving Tuesdays Feature, this is one that’s a bit different as it’s a sort of snack pot type thing. It’s an infusion pot by John West. 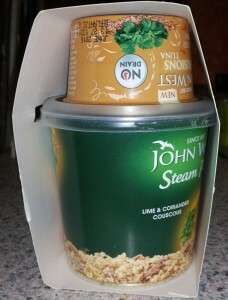 As it says in the picture above it’s a Tuna Infusions with Coriander and Cumin with Lime and Coriander Couscous. 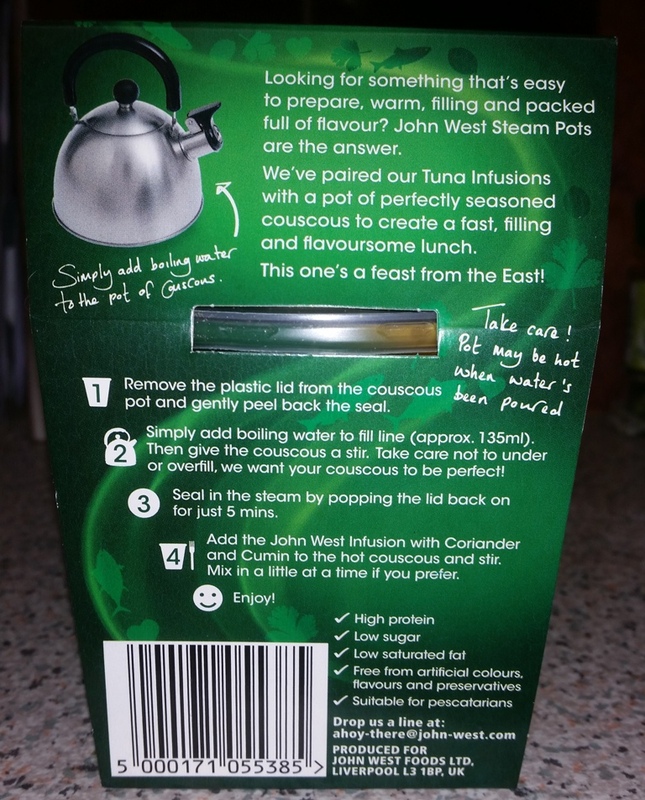 You can see that the steps are easy, there are lots of little tips dotted around the packet, like “Take care! Pot may be hot” You can find out more about this one here. You’ll notice the line in the picture on the left, you may be able to notice on the picture on the right (bad picture I know, scrap that they’re both bad 😳 ) that I had ripped the label … my mother wasn’t impressed. In my defence there was a perforation (not sure what for) and I was still able to make the line out lol (approx 135ml water). Once filled, give it a stir, then place the lid on and leave it steam for five minutes. I know the above image could be confused with cat food (sorry John West) but it doesn’t look the best. Don’t judge a book by it’s….metallic ring pull bearing lid 😆 ! After the couscous has had five minutes stir in the above pot of loveliness, you should do this while it’s hot. 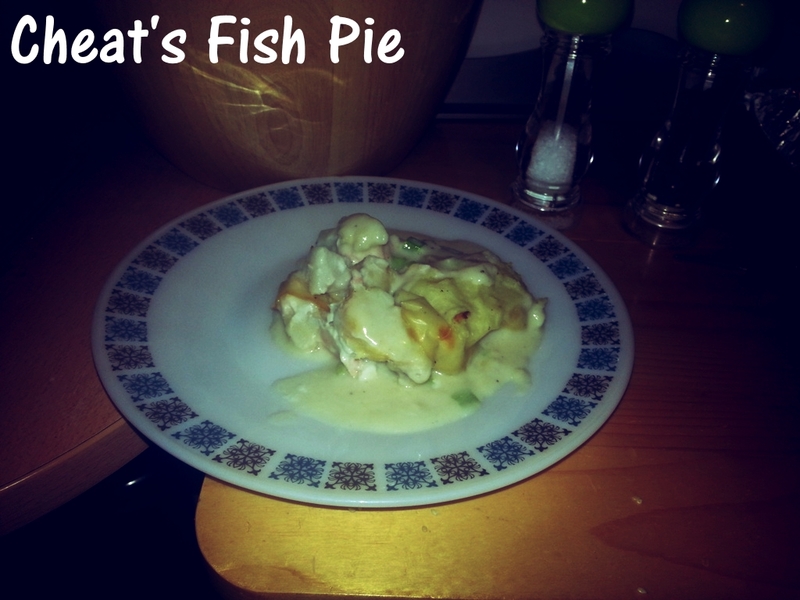 Looking for something that’s easy to prepare, warm, filling and packed full of flavour? 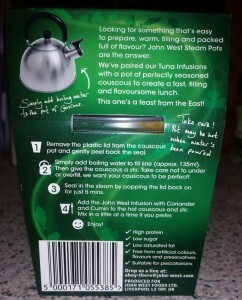 John West Steam Pots are the answer. We’ve paired our Tuna Infusions with a pot of perfectly seasoned couscous to create a fast filling and flavoursome lunch. This one is a feast from the east! This really does do what it says on the cardboard box, it’s two little pots of pleasurable loveliness. 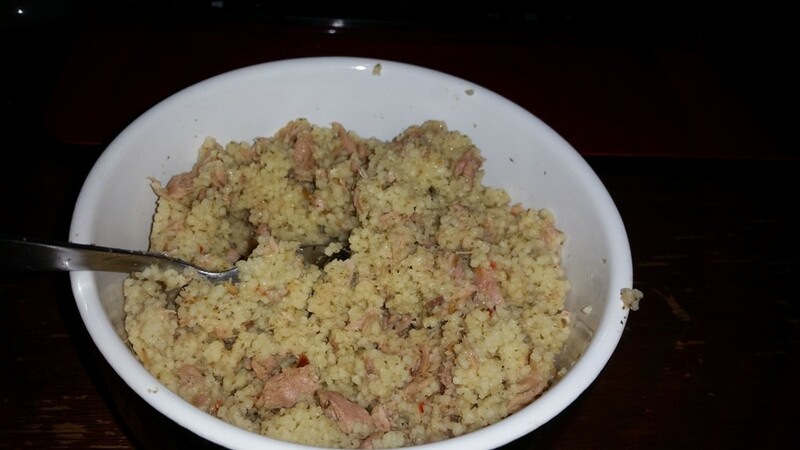 There is an excellent combination of flavours, the couscous is light and fluffy the tuna is tasty with a great flavour of coriander and the lime cuts through everything,. 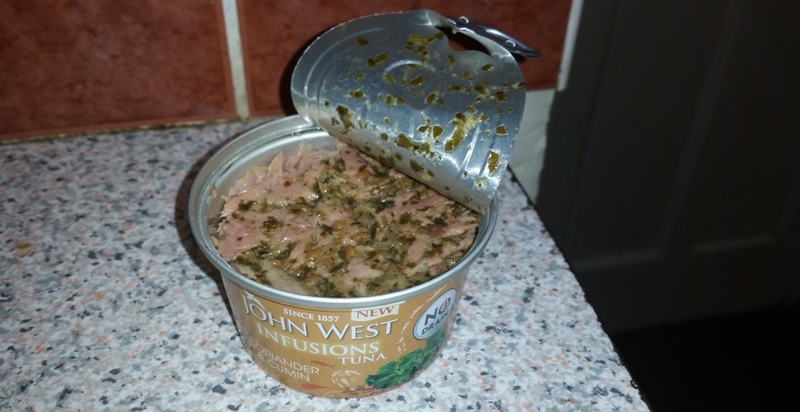 The flavours were delicate, not too heavy, it didn’t smack you in the face like a wet kipper. I personally have my moments with Coriander but it was great in this, not too overpowering. 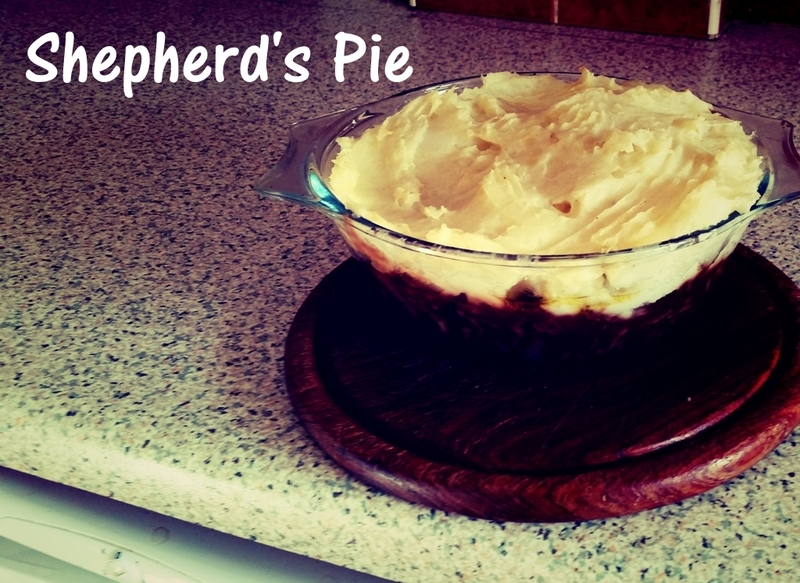 Our next recipe will be another Comfort Classics, it’ll be my version on a really easy and quick Shepherds Pie. 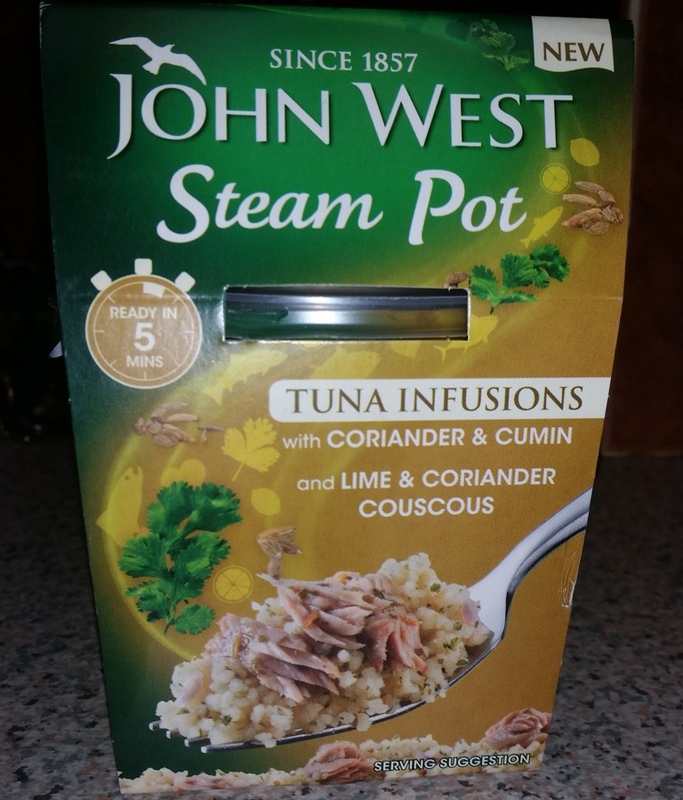 Until then enjoy the John West Tuna Infusions Steam Pot, if you like tuna remember I’ve made a Char-Char-Char-Grilled Tuna as part of my #StrictlySuppers feature, you can find it here.